Obituary – Moore, Deloris June “Hoppy” (Ewy) « Perry High School Alumni Association, Inc.
Deloris “Hoppy” Moore, 66, a native of Perry, died Saturday, Sept. 18, 1999, in Perry Green Valley Nursing Home. Services will be at 10:30 a.m. Tuesday in St. Mark’s Episcopal Church in Perry with Father Bill Powell officiating. Interment will be in Grace Hill Cemetery under the direction of Brown-Sisson Funeral Home. 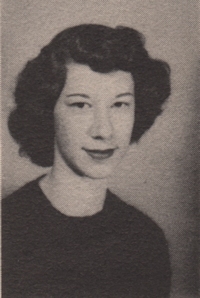 Mrs. Moore was born in Perry on Feb. 9, 1933, to Rudolph A. and Ann (Smith) Ewy. She graduated from Perry High School. She married Archie H. “Punjab” Moore on May 28, 1961, in Perry. She was a housewife and a member of St. Mark’s Episcopal Church. She was predeceased by her parents and two sisters. In addition to her husband of the home, she is survived by two sons, Jim Tearney and Dennis Tearney and his wife, Lee Ann, all of Oklahoma City; two sisters, Betty Balzer and her husband, Harry, and Norma Shoop, all of Perry; two brothers, Bob Ewy and his wife, Marge, of Perry, and Elmer “Bud” Ewy and his wife Gerry, of Blackwell, five grandchildren; and five great-grandchildren.